Team Bondi imploded after the game's release, but the CEO doesn't think he was that bad. 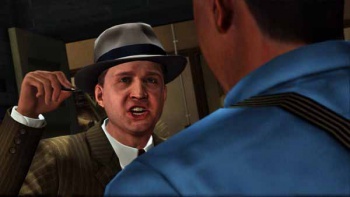 The gaming world anticipated 2011's crime drama L.A. Noire with excitement. Everything we saw coming out of the Australian offices of Team Bondi looked interesting and fresh. An open world L.A. crime story with real emotions displayed on suspect's faces was a really compelling pitch for a videogame. But L.A. Noire didn't quite get it right and rumors and accusations began to surface that Team Bondi CEO Brendan McNamara was a terrible boss and the team suffered from his mismanagement. Most of the staff left Team Bondi either during the final days of production on L.A. Noire or right after its release, and most of their wages are in arrears when the company folded. Brendan McNamara survived, and inked a deal to work at another studio on a game called The Whore of the Orient. Speaking about his time at Team Bondi, McNamara is understandably upset with what was said about him and compared his performance to other "terrible bosses" such as Steve Jobs. "It was a long, painful process, but making games is like making films in that it's a marathon, not a sprint - and some people come into the process not knowing that," he said. "Everybody has their view on who's the worst boss in the world, and maybe that's me," McNamara admitted. "I've read some amazing things about Steve Jobs in his biography, and I've never seen him get as vilified any way as much as I have. [Film director] Sam Peckinpah fired people off one movie, and nobody said a thing. Werner Herzog pulled a gun on Klaus Kinski to get him to finish a movie! Obviously, I don't compare myself to any of those people." When McNamara was asked point blank about the mistreatment of his employees, he demurred. "I think I've said all I want to say about that kind of stuff." It's always difficult to know what your legacy will be. Will McNamara go down as a tyrannical genius? Or just a blowhard with big ideas? Hard to say, but a lot will depend on how his The Whore of the Orient turns out.